Guy participates in DSC’s IFS program and has recently turned 26 years old. He lives at home with his parents and his brothers and sisters and a little Chihuahua. He enjoys spending time and engaging in all the things there are to do in the community. Some of the places he has visited recently include going fishing, visiting WEFT Community Radio, watching a Fighting Illini Women’s Basketball game, and playing basketball at Stephens Family YMCA. In addition to spending time in the community, music is also extremely important to Guy. He enjoys listening to music as well as attending live performances. Some of his favorite types of music are rock, Jazz, and funk. 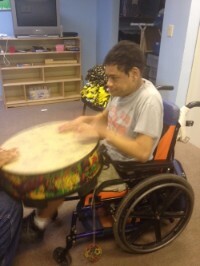 His favorite instrument is the drums, which he would play loud and rhythmically all day if given the chance. Guy also appreciates the special occasions where he can listen to live music, such as the band that play at DSC holiday parties and Parkland Pops. At his recent visit to WEFT, he enjoyed the broadcast of their jazz show. He is hoping for a chance to visit the Marching Illini during one of their practices this year. Besides music, Guy also enjoys being outdoors as much as possible. He likes going for walks in the park because you never know what you will see. He recently saw two men boxing! He is also looking forward to going swimming this summer.